Vattenfall officially opened the world’s largest offshore wind farm, Thanet Offshore Wind Farm, off England’s south east coast on September 23, 2010. The wind farm has 100 turbines and will generate electricity equivalent to the annual consumption of over 200,000 British households. To Vattenfall, one of the leading European energy companies, wind power is an important part of the energy mix. Between 2009 and 2011, the company will double its wind power electricity generation, constructing nine wind farms in six countries to supply electricity equivalent to the demand of 800,000 households annually. 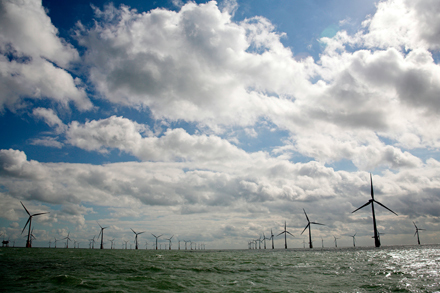 Thanet is so far the company’s largest offshore wind farm and a significant investment in renewable energy generation. 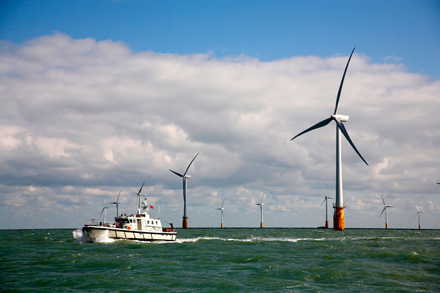 The electricity generated from the English Channel winds will constitute a significant increase of green energy in the UK and a considerable contribution to Vattenfall’s efforts to decrease the amount of car-bon dioxide emissions from its electricity generation. The opening ceremony took place at sea with the CEO and President of Vattenfall, Øystein Løseth, and the British Secretary of State for Energy and Climate Change, Chris Huhne MP, among the participants and the 100 wind power turbines as an impressive backdrop. Pointing out that Thanet Offshore Wind Farm’s 300 megawatts (MW) will take UK installed wind power capacity across the 5,000MW line, Rt. Hon. Chris Huhne MP hailed Vattenfall’s impressive engineering achievement and praised the energy company’s commitment to wind power in the UK. The construction of the 300 MW Thanet Offshore Wind Farm has taken just over two years and the wind farm is expected to operate for at least 25 years. At 300MW, it is the largest offshore wind farm in the world. 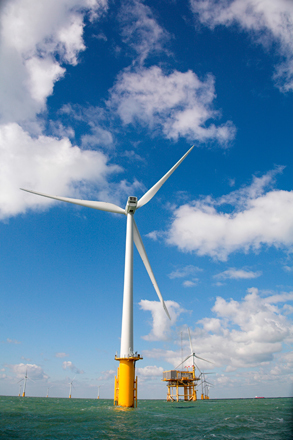 Each turbine is up to 115 metres tall at its highest point. The wind farm covers an area of 35 square kilometres, which is enough to cover 4,000 football pitches. This news and photographs are courtesy of Vattenfall.